Dules is originally from Cameroon but is now living in Paris. 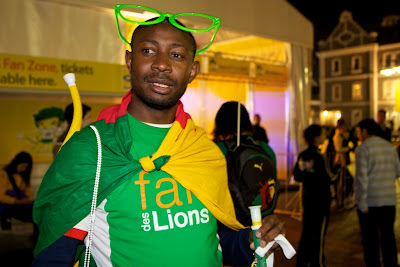 He purchased the team followers package, so he has been travelling around the country supporting Cameroon. This photo was taken just before the Holland vs Cameroon game in Cape Town on the 24th June. A. Amazed by infrastructure but disappointed in public transport. I’ve been unable to go out at night in Johannesburg because there is no public transport.